I dreamed that I was supervising the HSC examinations. It was the first day, English Paper 1. I walked into the hall a little before the scheduled start time of 9:20. 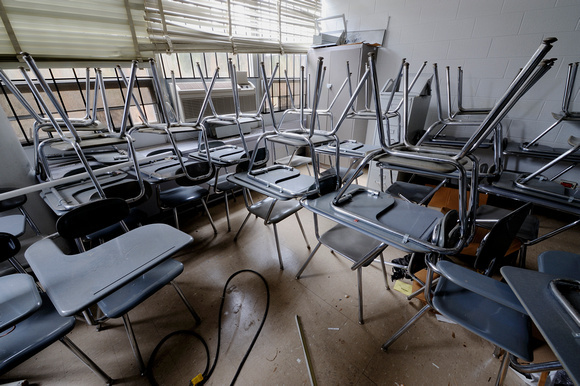 I was shocked to discover that instead of being set out in rows, the desks had been piled in a jumble in one corner. There were a few students standing around, but neither they nor my staff seemed inclined to help set up the hall. I got them started on what seemed like a simple task and went off to find the rest of the students. The students had dispersed through the school with some of them sitting in on classes even though their schooling was finished. Finally I had everyone together, and the time was past 11:30, the scheduled finish time. But at least we were making progress- two rows of tables and chairs were completed to my right and the students were progressing rapidly on the third row. Then I noticed that there was a row nearly completed all by itself to my left. That wasn't where it should be. I was about to rebuke the students, but then I realised that they had in fact left exactly enough space to insert an additional row between it and the completed rows on my right. At last we were nearly ready to get started. The Lord is restoring the church to an order that is different to what has been before. While all of our denominational structures seem good to human eyes, they are a jumbled mess to Him. Rather than bishops and priests, moderators and superintendents in denominational chaos, God's order for the church is a united body (one church in a locality, which may worship in a variety of congregations) all overseen by apostles and city elders. Much of the church is resistant to this although some see the vision of what is to come. Some will even try to go back to the old ways of what they have known. It won't happen according to human timetables or even in any kind of way that we might have expected. The Lord is in this and He will bring it to pass, and we do not have to be anxious about making it happen.